And Behind the Blog today will talk about the fanfic we are developing. Jokes and nicknames aside, everything you would want to know about our process, inspiration and non-senseness to write our own version of “The House of Hades”. This time, Ghost Writer and Franky will clarify these doubts! Koko: How did the idea of fanfic came up? GW: It all started with a conversation between me and Koko. Actually we were talking about the Iron Kingdom’s gunmages (because I had borrowed the book RPG for a friend) and talked about how they were awesome, but very underutilized in the game and such. I had just read “The Mark of Athena” and “The Demigod Diaries” and suddenly I realized that a gunmage would be pretty damn cool inside the world of Percy Jackson… a child of Hecate with guns! And so was born Morgan… and around it, a story where she could appear. F: Not to mention the fact that the Ghost Writer has always been a fan of Hecate . E o Por Trás do Blog de hoje vai falar sobre a fanfic que estamos desenvolvendo. Brincadeiras e pseudônimos à parte, tudo o que vocês gostariam se saber sobre o nosso processo, inspiração e falta de noção para escrever nossa propria versão de “A Casa de Hades”. Dessa vez, Ghost Writer e Franky nos esclarecerão essas dúvidas! Koko: Como surgiu a ideia da fanfic? GW: Tudo começou com uma conversa entre eu e a Koko. Na verdade estávamos falando sobre os gunmages de Reinos de Ferro (porque eu tinha emprestado o livro do RPG prum amigo) e falávamos sobre como eles eram awesome, mas muito mal aproveitados no jogo e tal. Eu tinha acabado de ler “A Marca de Athena” e “Os Diários do Semideus” e de repente percebi que um gunmage seria pra lá de legal dentro do universo de Percy Jackson… um filho de Hecate com armas! E assim nasceu a Morgan… e em torno dela, uma história onde ela pudesse aparecer. 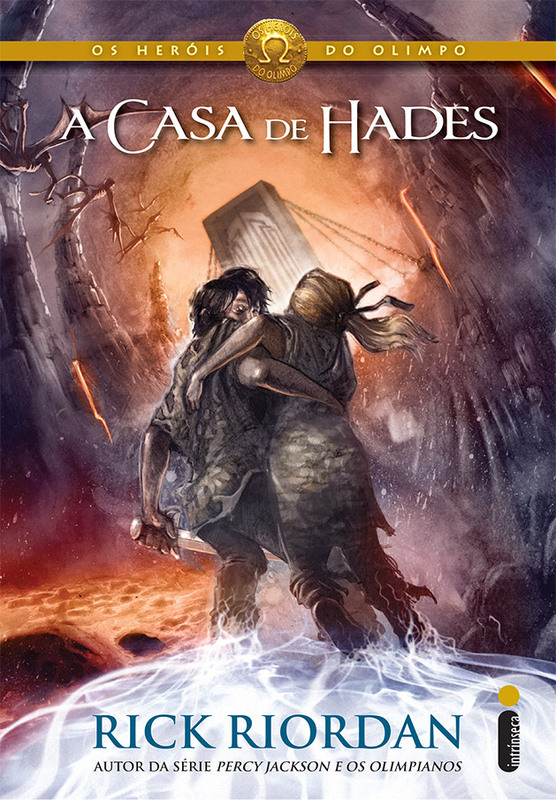 Lançada a sinopse e a capa nacional de "A Casa de Hades"
Rick Riordan expectations for the tour of "House of Hades"